Contemporary. Elegant. Different. And definitely glamourous. 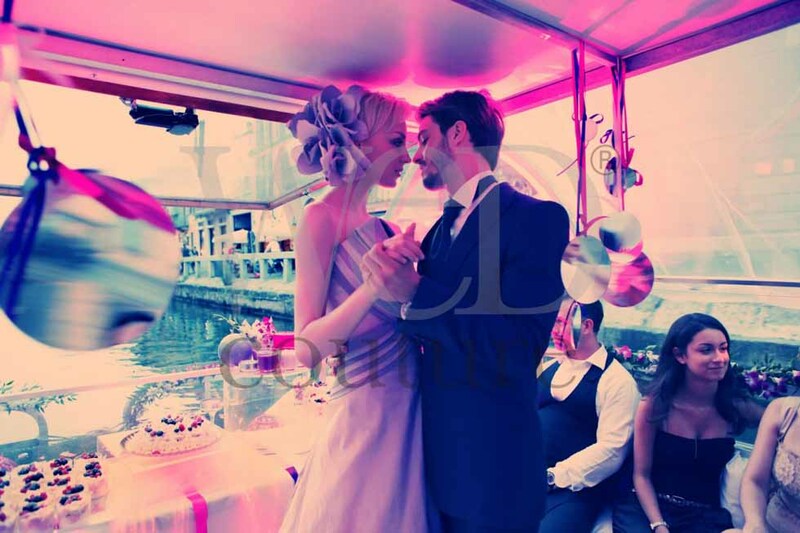 The perfect description for a wedding aboard one of our boats on the canals of Milan. You would maybe think that canals were just for Venice. They aren’t. In Milan you can host your Italian wedding while enjoying a luxury cruise around a part of the city and surroundings which is less known to the public, yet extremely beautiful. The “wedding happy hour” is particularly indicated for couples wanting a stylish, black-tie feeling without the formal setting of the reception. The boat, which can host around 40 guests, is through fabrics, light, pillows, flowers and lanterns transformed into a modern, high-society lounge leaving you with a sensation of being a guest in one of the chic venues downtown Milan. With the difference that your venue is taking you sightseeing while you are enjoying the party. Fabulous finger foods, important wines, cocktails and great music play important roles in the effort of making your Italian wedding, event or family gathering memorable and perfect. You can choose to have your whole reception on board or, if you prefer, we can arrange for a lush dinner served in one of the wonderful old mansions along the canals or prepare a luxury pic-nic among the rice fields. On the boat you can then enjoy hors d’oeuvres and champagne while we are taking you and your guests to your final destination. As a special feature, you can choose between four itineraries, making your event even more personal and tailored specifically to your dreams. The wedding aboard is ideal for those stylish, bespoke weddings and celebrations in which the party becomes a journey in itself. A new, chic way to gather the people you love in a way that has never been seen before. I’m proud to say that this particular kind of wedding has been chosen to be part of the collection “SposaMI”, weddings in contemporary Milan. An urban chic way of getting married in Italy, with the signature of WED Couture.